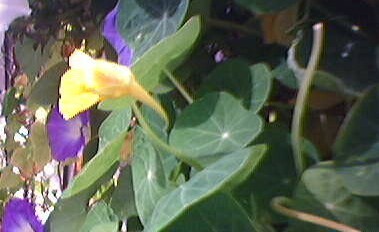 Yellow Nasturtium (against purple Morning Glory) has edible leaves and flowers. Color: My palette — which plays off my interior color scheme — consists of yellows, greens, blues and oranges. I’m using some selections that have performed well for me in the past as a base, and trying out a few new things, as well. Petunia is low-maintenance and reliable; I’ve picked one that is technically white, but the yellow throat results in sort of a light, lemon-chiffon effect. Lisianthus provides big, beautiful blooms, and this year’s mix has dark bluish-purple, pale yellow and light green colors. A Poppy with a stalk sturdy enough to withstand Chicago’s winds will help add the red-orange zing I’m after. Texture: My golden-colored Garden Sunflower is super plush — a positively visual texture. A new addition is the heirloom Bells of Ireland, which is a lime colored upright with sort of a clustered honeycomb look and feel (I’m attempting it from seed, so, fingers crossed…). Taste: I cultivate an herb garden every season that usually includes Mint, Cilantro, Thyme, Dill, Tarragon, Rosemary and Sage in boxes and dedicate two large pots to Basil (I enjoy gifting my friends with pesto). I also love long, trailing Nasturtium, which not only provides drama but is edible, too. Marigold (I’m testing out a big red-orange one this year) and Pansy (I ordered a ruffled variety) also are edible and great for decorating cakes and cupcakes. I’ve grown Jalapeno for the last two seasons, and this year I ordered seeds for a yellow version instead of the usual green. (Besides being fragrant, Lavender does double-duty in the kitchen.) And, as you can see in the site’s masthead photo above, my cat always gets his own pot of grass to munch on. I’d better get moving on my garden plans! I ordered the tomatoes from Tomato Growers Supply. Avis, you know I’m not usually a tender of living things (except myself), but as a passionate foodie, I can TOTALLY get into the concept of windowsill gardening for herbs! In fact, I’d forgotten that I have successfully grown basil and cilantro inside my 16th floor condo window. So despite my lack of outdoor space, I can still have fragrant basil to toss into a steaming dish of pasta or cilantro to sprinkle on chorizo tacos (about the only two dishes I ever make at home). Thanks for the inspiration — and the reminder — to pick up some plants and get growing (and eating)! Thank you for responding to both of my images and directing me here. I live in the country and I have a whole lot of space, but the water level is high and the yard collects and retains a lot of water. And since I just moved here about 3 years ago, I’m still just beginning to plant. I never heard of Lisianthus; I’ll have to look it up. I’m always looking for large blossoms… it takes too many to fill up a vase for still life photos. I’ve never eaten any flowers… I still contemplate trying out the day lilies. I have a lot of peppermint growing and I planted some lemon mint 2 years ago.